Tottenham can still qualify from Champions League Group B if they match or better Inter Milan’s result on Matchday 6, but that is a big ask, as Spurs visit Barcelona. The Catalan giants are already assured of advancing as pool winners but have a proud home record to protect in this competition. Ernesto Valverde’s men have already brushed aside PSV 4-0 at Camp Nou and Inter 2-0, so 23/20 they see off Spurs is our first Barcelona vs Tottenham prediction. Barcelona wrapped up top spot in smooth fashion when beating PSV Eindhoven 2-0 in Holland, with Lionel Messi scoring a superb opener and then setting up Gerard Pique with a well-worked free-kick. “This year’s group was one of the most difficult in recent years, but we have been comfortable winners in most of the games,” commented Pique on the club website. 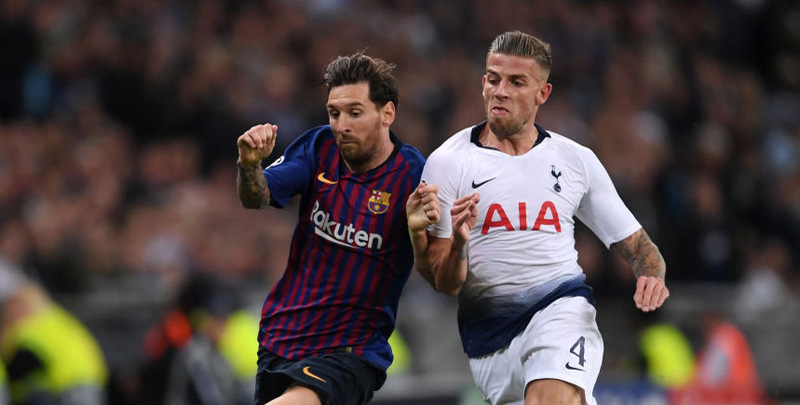 Barca may well make changes for this game, but it is hard to forget the way they tore Tottenham apart in a 4-2 win at Wembley, where Messi hit a double and could have had a couple more. The Catalan giants made it eight straight home wins against English opponents when crushing Chelsea 3-0 here in March, when Messi also bagged a brace. Looking at the Barcelona vs Tottenham odds, we reckon 12/5 for the hosts to lead at half-time and full-time is another tempting option. Tottenham have shown plenty of spirit to stay in contention for a top-two finish with back-to-back victories over PSV and Inter in London. Harry Kane hit an 89th-minute winner in a 2-1 success against the Dutch outfit and then Christian Eriksen struck the only goal of the game late on versus the Nerazzurri. “We started off rocky in the group stage this season with a couple of poor results,” said Harry Winks. “But if we can get though, it shows how mentally strong we are to come back. “It is going to be a very difficult game going away to Barcelona, probably one of the most in-form teams in Europe right now. “It is going to be a real challenge, but we showed in parts against Barcelona at home that we can match them and be just as good as them. Kane, Eriksen, Dele Alli and Son Heung-min have all been in good form for Spurs, so they do have the danger-men to cause problems at Camp Nou. However, we still favour the hosts and are adding 35/4 for a 2-1 home win to our Barcelona vs Tottenham betting tips. Tottenham are likely to pick Kyle Walker-Peters at right-back, as Kieran Trippier and Serge Aurier (both groin) have stayed at home. Juan Foyth (ineligible) and Victor Wanyama (knee) are also absent, but Erik Lamela is fit after a thigh injury.